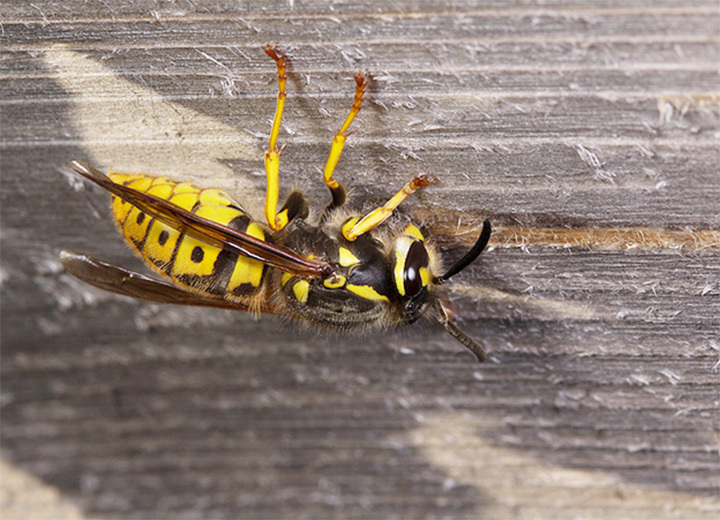 Wasps are a big part of outdoor life this time of year in Coastal BC. It seems we have more than our fair share of scavenging workers pestering us at barbecues and picnics. The long dry summer was ideal for nest success and thus we have a large population approaching the end of their colony cycles. But which insects are responsible? 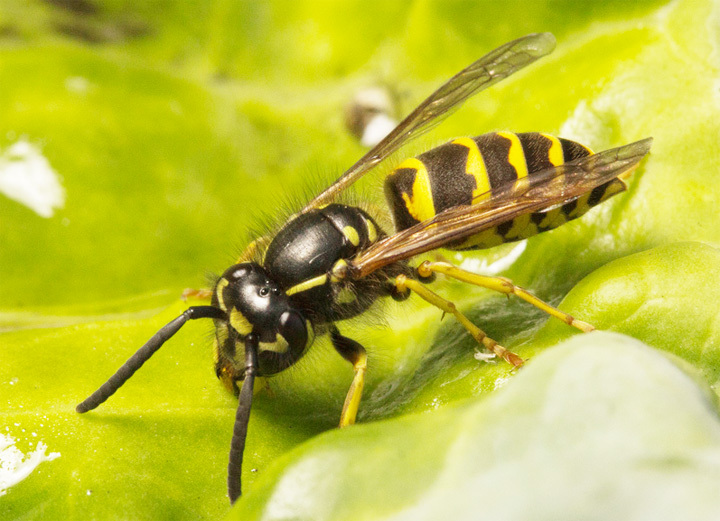 It turns out only three of the common wasps we see are much of a nuisance outdoors, and all belong to the genus Vespula. Below are some short summaries of what they look like and what the differences are. Genus Vespula: ground or structure nesting, large colony sizes, often scavenge in late season at outdoor cooking or dining areas. 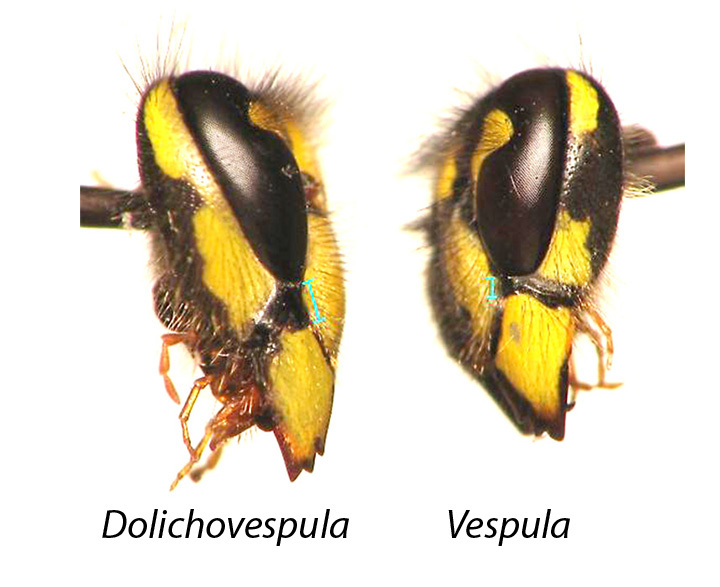 They differ from a related genus Dolichovespula by having the mandible closer to the eye than the latter. Common Yellowjacket: Vespula alascensis: somewhat smaller than the Western, this species has an interrupted yellow band behind the eye. This individual is gathering paper fibre for nest-building. 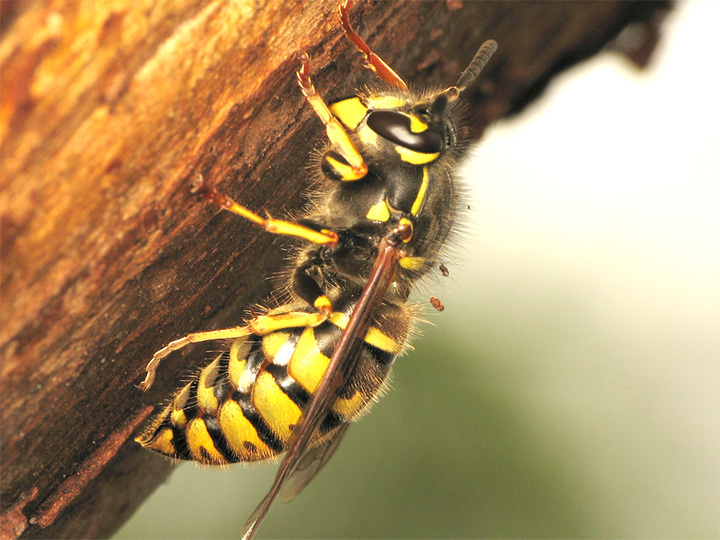 German Yellowjacket (Vespula germanica): This also does not have a complete band around the eye, but it does not have the interruption in the yellow band behind the eye. Often black spots are visible on the abdomen. 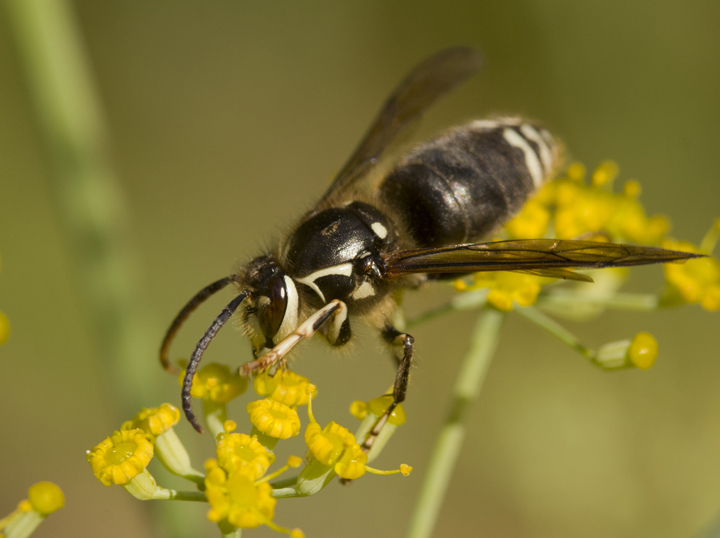 Dolochovespula: We have two common species in BC, the Common Aerial Yellowjacket, Dolichovespula arenaria and the Bald-faced Hornet Dolichovespula maculata. Unlike the Vespula, these hang their nests from branches and projections, and so they are often visible. They do not scavenge, except for sugar sources (you may see them on fruits or flowers). This is a nest of Bald-faced Hornets. 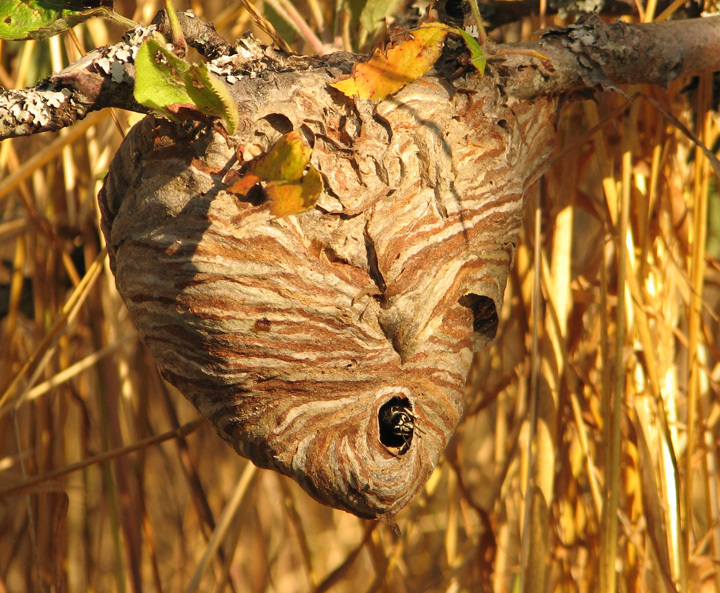 Aerial yellowjacket nests are similar, hanging from branches or obstructions. A common aerial yellowjacket (Dolichovespula arenaria) foraging. 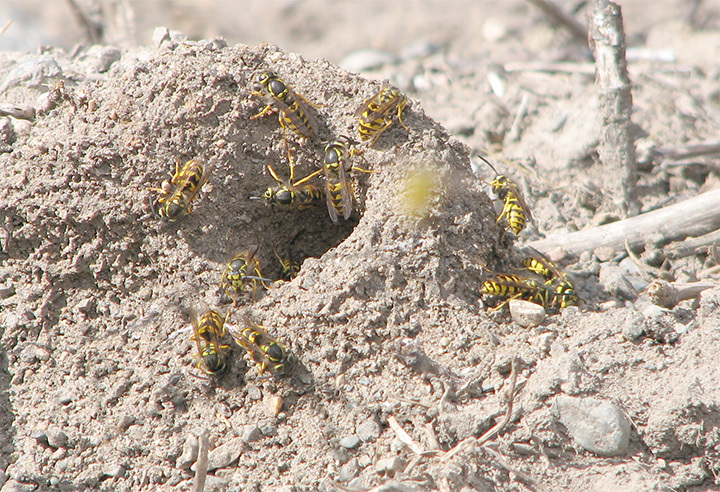 Common aerial yellowjackets on their nest. The upper one is the queen, the lower one a worker. 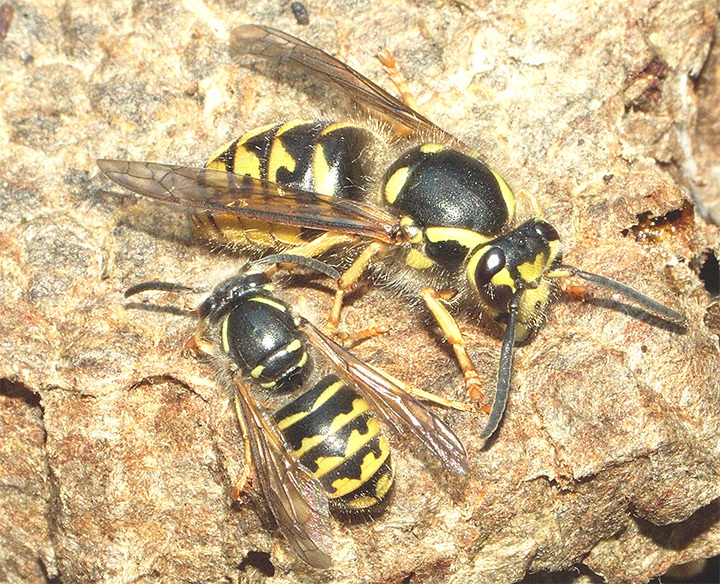 Two genera are found in BC; Polistes and Mischocyttarus. They are superficially similar, but Mischocyttarus has an elongate “petiole” joining the abdomen to the thorax. Their nests are open, meaning they are without an envelope, and are often found under overhangs. They are not very aggressive. 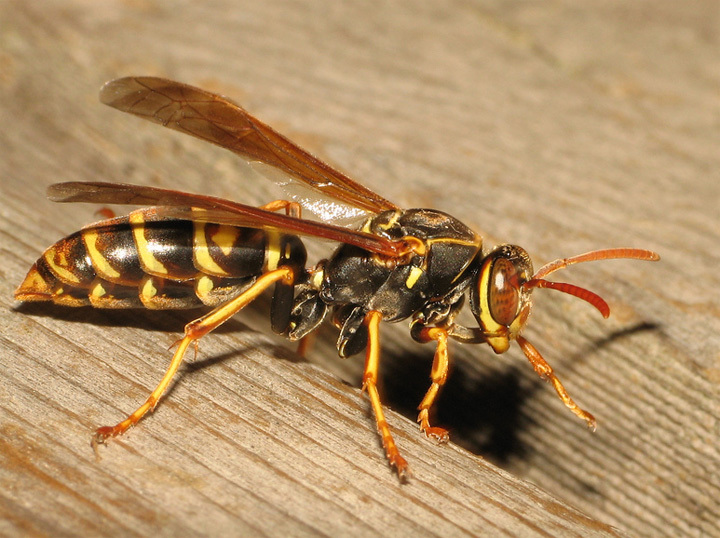 The European Paper Wasp: Polistes dominula. 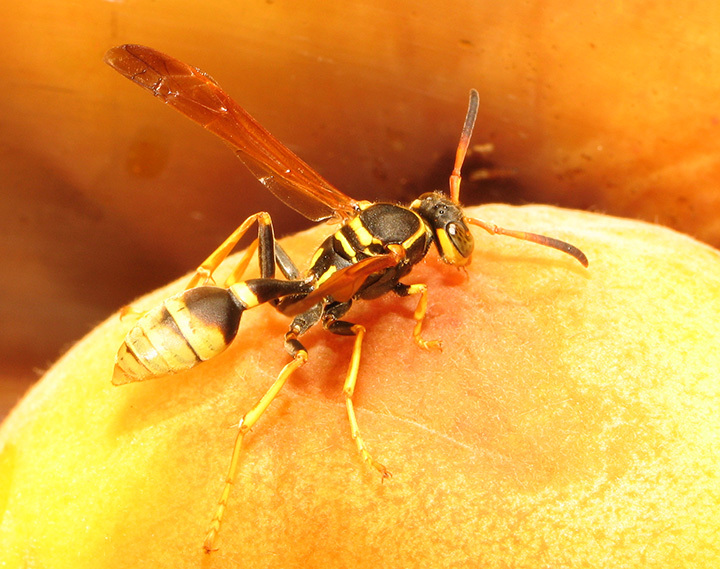 This species is overall yellow and black, with yellow or orange antennae. Polistes aurifer. This species is larger, darker, and much less common than it used to be, perhaps due to competition from Polistes dominula. Mishchocyttarus flavitarsus. This odd paper wasp is a member of a genus that is mostly found in the tropical and subtropical parts of the Americas. This is one that makes it as far as Canada. Summary: There is quite a diversity of social wasps in BC, many of which will not be found in cities at all. They are important players in ecosysyems, as predators, scavengers, and possibly pollinators. Avoiding conflict with them is easy, provided they don’t nest near your entrances or walkways, as stinging typically occurs during nest defense. If you wear long sleeved white or light coloured clothing with close fitting cuffs, the chance of an accidental sting are minimized. Some stings can be life-threatening to some people, so if you work with groups of people, familiarize yourself with the symptoms and treatment of anaphylaxis, and always have an Epipen and phone ready. Nest destruction should be contemplated if the nest is going to bring people or pets very close to the nest entrance, as the number of stings from a defensive colony at close range can be severe. 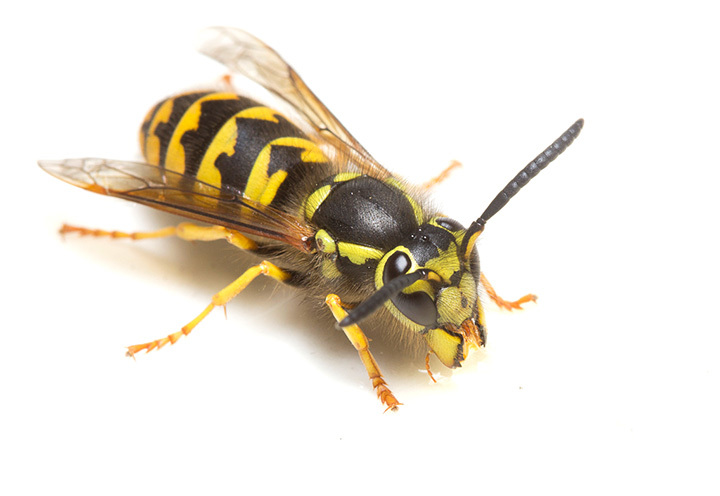 Over-the counter wasp killers work well for simple to access nests, but more difficult to reach nests inside structures may require the pros. I simply leave nests be if they are out of the way and not likely to pose a threat. 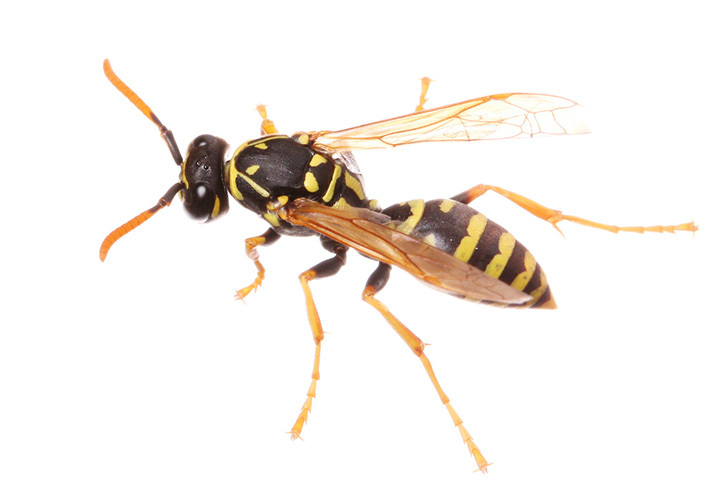 If you find a nest and would like to help us out in the lab, we would love to collect some or all of the wasps! You can emal Sebastian Ibarra at sibarra@sfu.ca or call us at the lab at 778-782-5939. 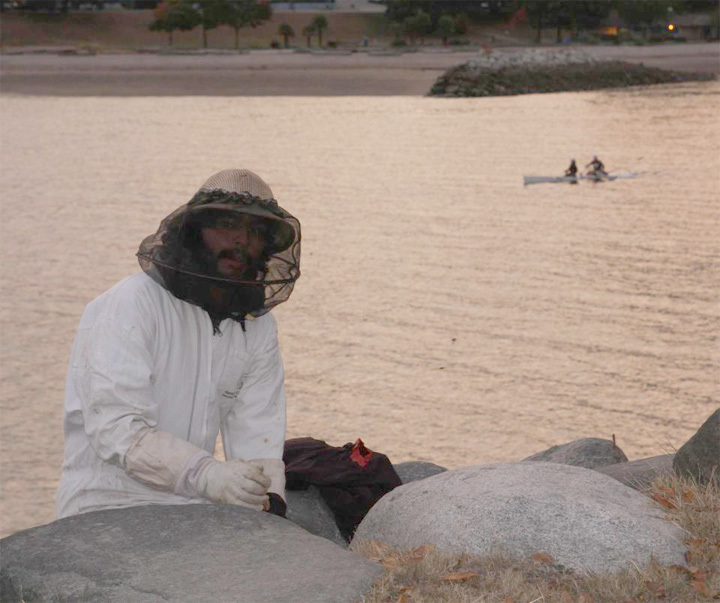 Sebastian collecting Western Yellowjackets by the water. This entry was posted on September 3, 2013, in Uncategorized and tagged conflict, identification, wasps, yellowjackets. Bookmark the permalink.